Black and white abstract floral jacquard fabric already gives the Sherry for Classic Bags an air of decided elegance—but it’s the clever details that make the real difference! 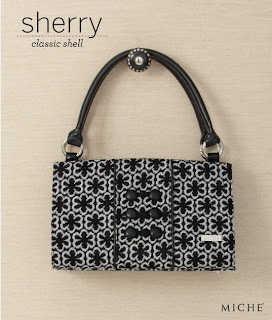 The front has three pairs of tied black buttons add a real touch of whimsy to this Sherry's Miche Shell’s design. The look is absolute perfection both for the office and for a night on the town!